STAR Project (contract n.: EVK1-CT 2001-00089) "Standardisation of River Classifications: Framework method for calibrating different biological survey results against ecological quality classifications to be developed for the Water Framework Directive" is a research project supported by the European Commission under the Fifth Framework Programme. It ran from 2001 to 2005. Moving from the results of the AQEM project, STAR project has deepened the investigation of issues related to streams and rivers assessment methods in the framework of WFD implementation. In particular STAR have dealt with the ‘diversity’ of assessments methods all over Europe. The number of organism groups used to assess Ecological Status, and the number of methods available for such purpose are so diverse that inter-calibration and standardisation of methods is crucial. Similarly, protocols need to be devised to integrate the information gathered on the different taxonomic groups. STAR consortium involved eleven European countries (United Kingdom, Austria, Czech Republic, Denmark, France, Germany, Greece, Italy, The Netherlands, Portugal, Sweden) plus three then Newly Associated States (Latvia, Poland, Slovak Republic). In Italy 2 stream types belonging to 2 areas has been selected: 1. Small streams, calcareous catchment, above 800 m, Alps, Trentino-Alto Adige ; 2. Small streams of the Central Apennines, calcareous catchment, between 200 and 800 m, Toscana. With a similar approach adopted during AQEM Project, STAR project has widened the area of investigation, by considering, in addition to macroinvertebrates, all the Biological Quality Elements requested by the WFD for rivers: diatoms, macrophytes and fish fauna, plus hydromorphological elements. A set of tools were developed, or adapted from existing, according to the project's targets. Software products are publicly available and can be downloaded here. guidance in the design of monitoring programmes (MONSTAR). Among other results, STAR Project played a crucial role in providing technical support to EU intercalibration process, in particular by providing key elements for the development of biological Intercalibration Common Metrics. Results of this activity are available in this publication (Quaderno IRSA 123 – STAR Deliverable n. 11). Results of STAR project are also available in the Hydrobiologia special issue n. 566 (2006). 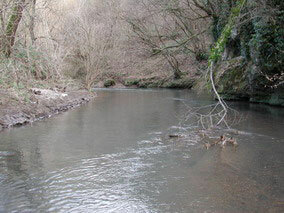 Some of the river reaches investigated in Italy.